Image credit: Lorenzo De Leonardis. A few thoughts and impressions about Moise Kean of Juventus FC and the Azzurri. He burst upon the scene with a goal in his national team debut versus Finland in a Euro 2020 Group J qualifier in Udine last Saturday. 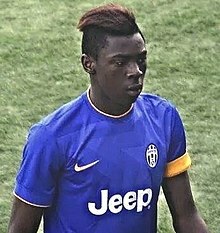 Moise became the second-youngest Italian to ever score for the senior level Azzurri. 2. The influence of Max Allegri et al. 3. Staying at Juventus instead of going out on loan. 4. An apprenticeship from experts. 5. Roberto Mancini on Kean. 6. A discussion at Calcioland. "Il Predestinato" (the chosen one) according to Roberto Mancini in pre-match comments before Italy v. Finland for a Euro 2020 Group J qualification match in Udine. That term was a significant label although Mancini has much experience developing young talent. The influence of Massimiliano Allegri, Cristiano Ronaldo, Giorgio Chiellini et al have also been integral and influential in Kean's development. Allegri obviously rates the player highly. Late in a UEFA Champions League elimination tie versus Atletico Madrid, Mister Allegri subbed in Kean. Moise almost beat the keeper, Jan Oblak, a few minutes later with a left-footed shot that went just barely wide of the far post. Moise wanted to leave Juventus in January. His captain, Giorgio Chiellini, in an interview that was posted on Gazzetta TV yesterday, advised him: "I spoke to Moise in January. He wanted to go out again on loan. I told him to be patient and bide your time. Your chance will come." Perhaps it is better to remain at Juve than be loaned out where he would play more. There would be more pressure to perform immediately at a smaller club now that his notoriety has increased. He did spend a year on loan with Hellas Verona during 2017-2018. Younger players need to serve apprenticeships, to learn from experts, not only on the pitch but away from it. Juventus is a winning environment. Kean had been in the youth sector for many years. "Seeing CR7 every day makes you grow up. I learn so much from him." --- Moise Kean post-match from Udine quoted by La Gazzetta dello Sport. This is the best reason of all for young Moise to remain at Juve. When a da Vinci or Michelangelo is in your studio, you carry the paint or marble all day long for him. Can Moise Kean step up for #ITA? I discussed the Azzurri, Roberto Mancini, Giovanni Trapattoni, current storylines in Italian football including young players such as Moise Kean, Cristiano Ronaldo's impact at Juventus, Rino Gattuso at AC Milan, with David Amoyal at Calcioland. The segment begins at 47:00 in his broadcast.